The Arizona Department of Health Services in Phoenix supports its nursing moms at work with three lactation rooms and an Infant at Work Program. The program allows employees to bring their infants to work for the first four months, with a month-by-month extension up to six months. 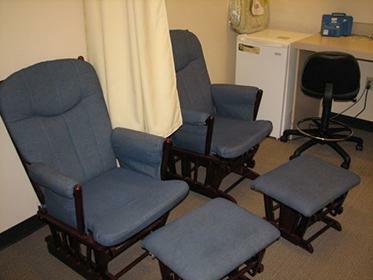 Amenities in these nursing rooms include comfortable padded chairs, a sink, electric outlet to plug in your own breast pump if not using a manual pump, baby changing tables, and the doors close while rooms are in use. One room supports two mothers at one time with curtains provide additional privacy for moms.